Step One: If you don’t have the budget to properly do something, don’t do it. Lockjaw on the show is amazing, but Medusa’s hair was terrible. So change it, make it one long braid, something much easier to animate, much easier to show it moving. Step Two: Vary the setting. I know they are confined to Hawaii, but...that’s super boring. We are basically watching the same story (“A member of the Inhuman Royal Family runs into a human, is prejudice against them, learns that they are actually pretty good, becomes a better person”) played out over and over again. The setting and the story need to vary. Step Three: Make the characters more sympathetic and more complicated. This is the main problem with the show — by the time we actually get some good backstory, it’s already halfway through and we don’t care. Right now, a lot of the audience is rooting for Maximus for the sheer reason that he’s against a brutal caste system and the Royals are for it. That isn’t a good sign. So: how do we do these three things? Well, the first two episodes were shown as a movie, so why not make them self-contained? In fact, why not make every episode self-contained? 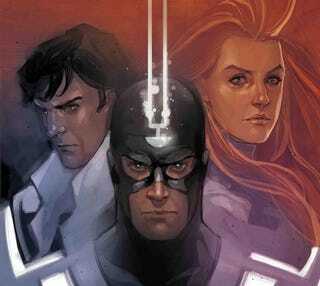 Having an anthology series about the Inhumans sounds like an excellent way to show each of their characters deeply. Deep in the Himalayan mountains, the city of Attilan stands still. Maximus the Mad, brother of the King of the Inhumans, has usurped the throne and tossed the Royal Family into the dungeons. Together, they must find a way to stop Maximus from revealing the Inhumans to the world and spreading his madness. What happened to make Maximus insane? Explore the childhood of young Black Bolt and Maximus as they grow and learn and become orphans. And then see how the Unspoken King came to be and how the brothers united again. What about Medusa? Forced to bind her hair, weaving it into braids stronger than steel, the Queen of Attilan remembers fighting with her sister in the Silent Revolution against the Unspoken King. Meanwhile, an archaeologist discovers an ancient tomb. When Triton disappears in a mission to find another new Inhuman, Karnak makes it his mission to find his missing brother. Even if it means finding himself in a strange new land. Even if it makes breaking this strange new land. Meanwhile, Sentry 459 is active. Sentry 459 needs more data. Where is Sentry 459? Gorgon decides to bring back some of the new Inhumans to Attilan, creating a conflict with some of the older members of the society. Where does tradition end? How far will some go to keep their city safe? Meanwhile, Sentry 459 has recovered its mission: kill all Inhumans. The story of the origin of the Inhumans is here, the story of the Kree and the original Inhumans, including the exile of Hive. The story of the original revolution and when the Kree left, they left behind a present: Sentry 459, known as Death to Inhumanity. Meanwhile, Sentry 459 has discovered Attilan. All hope is lost. Repeat: all hope is lost. The war unites the brothers again, but can Black Bolt trust Maximus after everything he’s done? And how far will Black Bolt go to stop the Kree Sentry from killing every single Inhuman? Will he expose Attilan itself? Can he? Finally, Black Bolt speaks. But what will he say?